I watched a talk by Clionadh Raleigh on Climate Violence (see video at the end of the post). I’m still not entirely sure what to make of it, but I certainly found it quite thought provoking. The bottom line was that there is very little evidence (if any) to suggest a link between climate change and conflict/violence. In fact, the speaker appears to have significant issues with the climate conflict debate. In particular, the idea that it’s deterministic. In other words, the suggestion that people in some regions might respond deterministically to changes in climate: it gets warmer and they become more violent, for example. This is clearly nonsense. Similarly, the military regarding it as a security issue, rather than a humanitarian issue, is also problematic. However, it wasn’t clear to me that what some are suggesting is that it is indeed deterministic. My understanding (and I’m not that familiar with this, so may be wrong) is that there are indications that climate change may be exaccerbating factors that could enhance instability in regions that might be prone to instability. I’m not aware of examples where people have made claims of actual environmental determinism. Additionally, even if there is little evidence of a link now, continuing to pump CO2 into the atmosphere could produce changes that could impact these regions. In fact, the speaker seemed to acknowledge that environmental factors could be linked to conflict, but seemed rather dismissive of a link between these environmental factors and climate change. However, there was an aspect of the talk that I thought I would comment on further. Part of what was presented seemed to be rather critical of natural/physical scientists and suggested that some of what they were supposedly doing was appalling and dangerous. Not only are these quite value-laden, but if someone thinks this rhetoric is appropriate, then they become open for it to be applied to them too. Someone in the audience pointed out that after reading the talk abstract, they’d assumed that the speaker was a science denier, which the speaker strongly denied (and their talk did make this pretty clear). It was also pointed out that by dismissing a link between climate and conflict you run the risk of people assuming that mitigating climate change is pointless, especially given that we can’t dismiss such a link in future even if there is little evidence for such a link now. Given who seem to be promoting this talk (Global Warming Policy Foundation, cliscep, Paul Homewood) this would seem to be a valid concern. I think it’s perfectly fine to be clear about what the evidence suggests, but one has to be careful of making too strong statements (there is no link to climate) to rebut others who are also making statements that are too strong (there is a clear link to climate). However, I did find the talk very thought provoking and would be interested in other people’s views. I do think we have to be careful of presenting results that suggest that there are people in some regions who will mindlessly respond to climatic changes, because this is clearly nonsense. On the other hand, we have the potential to emit enough GHGs that we could produce substantial changes in regions that are potentially prone to instability, and appearing to dismiss this (or being interpreted as dismissing this) can also be problematic. This entry was posted in Climate change, Global warming, Research, Scientists, The philosophy of science and tagged Climate change and violence, Clionadh Raleigh, cliscep.com, Global Warming Policy Foundation, GWPF, Oxford Martin School, Paul Homewood. Bookmark the permalink. I’ll make another point in the comments. Part of the speaker’s issue seemed to be with people who appeared not to understand the detailed socio-political issues that can lead to conflict. This may well be a valid criticism. However, it wasn’t clear that the speaker fully appreciated the details of climate change, both what has already happened and what could happen in future. Also, the debate about climate and conflict seems somewhat more nuanced than between those who understand the socio political issues and natural/physical scientists who focus too much on climate. For example, there was a meta study that seemed to find a link between climate and conflict, followed by a comment that included Clionadh Raleigh (and Richard Tol), and then a response from the original authors. Seems like there is rather a healthy debate. Stresses are stressful. It’s not a difficult question, methinks. Yes, that was kind of my thought. My impression is that part of the issue is people who think that we’re ignoring important socio-political issues and focusing only on one factor (climate change). I’m sympathetic to this, but do think that there is an element of strawman to that position. Also, climate change is driven by our emissions and so some of this is highlighting that unless we do something to reduce our emissions we could be stressing parts of the world that are least able to cope with these stresses – it’s not that they’re somehow unable to not respond deterministically, it’s that we can choose do things to reduce the stresses that these regions are likely to have to face. You 1st need a good enough S/N ratio. This is data driven. We might have a good idea of GMSL and GMST and population growth by 2100. In other words, the real impacts are in the future. Whatever you think you see now, is clouded by the very fact that what you see as climate change others see as weather, and visa-versa. You see something and want to believe that it is real and happening now (not climate change per se) and already affecting humans in large numbers (read that as billions). Uncertainty is not your friend? When, in all of human history, was uncertainty ever our friend. Define greater uncertainty relative to what, less uncertainty? And well, I’ve made this argument before. You are projecting on the NOW what will happen in the FUTURE. Not you, and not any one individual that I personally know. What WILL happen, is not the same thing as what IS happening. I would argue that climate change is not adversely affecting large numbers of humans today. In other words, if climate change were adversely affecting large numbers of humans today, there would be no debate. IMHO, that is the basic problem with climate change, that it is slow on human timescales, that is what the lecture means to me, that we still can’t objectively measure the affects of climate change on humans. I would argue that climate change is not adversely affecting large numbers of humans today. In other words, if climate change were adversely affecting large numbers of humans today, there would be no debate. Ahh, okay, I agree. If it is already adversely affecting us today, then it’s still pretty hard to find the signal in the noise, which is why there’s so much debate about it. Thanks be for MT, who puts it short and sweet. The military term is “threat multiplier”. Take a family trying to feed itself and its children (and feeding children, it appears, is more conducive to passion than feeding oneself) and add to it a teenage boy with access to the means of violence. Viola! That’s a simplistic scenario, but desperate people are taking their lives one meal at a time. Famine, hunger, shortage of necessities: makes everything else irrelevant. There seems to be clear evidence that higher temperatures lead to more violence (1,2,3). Surely if climate change can lead to higher local temperatures, then one would think climate change can also increase the likelihood of violence—and that’s without more indirect climate stress caused by such things as drought and crop failures? Then again those Vikings did go raiding England in Summer and slept in all winter, a bit like Polar Bears really. “If it is already adversely affecting us today, then it’s still pretty hard to find the signal in the noise”. There is a big difference between what we are pretty sure will happen and trying to look for signs of it early in the process when it is mostly noise and trying to claim changes due to the noise as changes due to the 30- 50 years in the future expectations. It is refreshing to see this openness. Last Octoboer, Barack Obama had a public event where he linked the Syrian Civil War to climate change. He wasn’t the first to make this link, but he was the most well known. Other people have stated this before, but Obama publicized it in a broad way. “There’s already some really interesting work — not definitive but powerful — showing that the droughts that happened in Syria contributed to the unrest and the Syrian civil war. Well, if you start magnifying that across a lot of states, a lot of nation states that already contain a lot of poor people who are just right at the margins of survival, this becomes a national security issue. Others have drawn the conclusion that the rise of ISIS is also caused by climate change. The Syrian drought has been severe — the worst in 900 years according to NASA (75% of crops failed and 85% of livestock died.) There is not a substantiated link between the drought and the war, but I think there has to be such a link. As Roger Pielke, Sr. has mentioned — there is a stronger anthropogenic link between land use change and precipitation than there is between temperature change and precipitation. My biggest problem is the over-simplified math, “… if you start magnifying that across a lot of states .. .” That is a conclusion which is not supported by the Syrian studies. These informal conclusions perpetuate the stereotype that the tropical climates (especially Africa and the Middle East) are conflict prone. Everything that I’ve read has concluded that the best route to reduced conflicts is Democracy and economic opportunity. Climate Change doesn’t affect that. One claim made in the talk was that when people suffer they don’t necessarily resort to conflict; there are indications that they cooperate. I guess an issue is whether or not we regard the outcome as being increased conflict, or rather stress the humanitarian aspect of this issue. Again, the speaker seemed to be arguing against some of that work. The issue was the suggestion that it’s somehow environmentally deterministic; people will simplisticly respond to changes, which does seem wrong to me (although it’s not clear that this is actually what is being suggested). I presume he cited his own work when claiming this? I think it’s reasonable that changes to the land can influence evaporation and hence precipitation. However, this doesn’t somehow mean that increasing temperatures won’t also change the hydrological cycle. Claim a deterministic relationship between the Syrian drought and the civil war and you claim that human behaviour is also deterministic. In practice we follow a range of different behaviours in response to a stressful event. Some respond altruistically and cooperatively. Others react selfishly or violently. Think rather as the response to stressors as probabilistic. The Syrian drought did not cause the civil war, but it did increase the probability that it might happen. My knowledge of relevant history at the level of an interested amateur at best, and dominated by Britain and North America. However when people are faced with shrinking resources in a constrained environment the resulting zero-sum games that typically result are rarely resolved in a calmly measured, peaceful manner. From mass migrations of nomadic tribes from central Asia to conflicts over grazing and water-rights in the American West that continue today, when push comes to shove, people generally shove. Civil conflicts demonstrate that when a society begins to fray, small but violent minorities often determine the style of conflict, regardless of the inclinations of larger peaceably inclined majorities. Think of Syria and its humanitarian and refugee crisis as a small taste of what could come. There are many regional papers which discuss the same effect. For instance, Indiahttp://www.hydrol-earth-syst-sci.net/20/1765/2016/, Brazil http://onlinelibrary.wiley.com/doi/10.1002/asl2.543/pdf, and the United States http://www.beg.utexas.edu/cswr/pdfs/Xu_J_Hydrol_13_Biofuels_Midwest.pdf & http://landsurface.org/publications-protected/J52.pdf. Changes to agriculture and groundwater in Syria have been pretty well documented. In other words — if you want to link climate change to conflict, then you have to explain away the drop in global conflicts since the end of WWII at the same time that the climate was warming. It’s too easy to use the Middle East as a convenient scapegoat for “heat” causing conflict. Yes, I realise Roger has spent most of his career on this topic. However, these land use effects don’t somehow negate the impact of the continued emission of GHG into the atmosphere. Also, the latter is essentially a global, rather than regional, issue, while the former can probably be mostly dealt with regionally, rather than globally (unless you think that we should globally regulate how we use land at a local level). It also doesn’t help that Roger seems to think that everyone must do what he says (or must agree with him), and that they don’t implies something fundamentally flawed with climate science in general. lorcanbonda seems to be arguing that before you can link climate changes to conflict you need to show that nothing else can have an impact on conflict. What mt said (and Everett F). In other words — if you want to link climate change to conflict, then you have to explain away the drop in global conflicts since the end of WWII at the same time that the climate was warming. The incorrect assumption here is that warming post-1945 was sufficient to increase the incidence of conflict. Obvs if it wasn’t, all you got left is rhetoric. I think, strictly speaking, the incorrect assumption is that if something decreases that there can’t then be factors that, by themselves, would have lead to increases. It seems self-evident to me that resource depletion, changes in rain patterns, increasing heat, etc are raising the level of suffering on the planet. The whole arab spring movement correlates well to rising price of grains and that is related to crop failure etc. Agree with lorcanbonda but I think we are running into some strange form of groupthink on display here. Startling to read through this one. Spikey day with CO2 after a lot of days under 2 ppm. Dailies are noisy, but there is not lipstick on the planet to slap on a 411 daily average number. That is simply an ugly, ugly number. The problem is that the cause of the drought is most likely aggressive (non-sustainable) farming mandated by the ruling Baath Party. The planning insisted on high water agriculture to “ensure” that they were self-sufficient as a nation and to export cotton for cash. The article you link appears to be talking about intensive use of water for agriculture causing water scarcity issues in other sectors on the very simple basis that there is a finite resource and if you use more of it for one thing, less will be available for other things. That’s not talking about a cause of drought. Obviously water-intensive activities become more important/problematic when drought does strike because total available water is reduced in such times, but they aren’t the cause of reduced total available water. As with any single short-term regional weather/climate event, attempting to attribute a particular instance of drought to anthropogenic causation is a highly uncertain undertaking. However, one thing we can say is that increased drought in the Middle East is one of the more robust precipitation-oriented projections as a result of manmade GHG climate change. If we agree that drought is a particularly important trigger for conflict in this region (and many others) it seems reasonable to propose that, according to current understanding, climate change will cause (and has caused) an increased threat of conflict there. Attributing a particular conflict event to anthropogenic climate change is exponentially more difficult. Not only do you have to attribute the climatic factor(s) perceived to be involved to anthropogenic causation, you also have to attribute the causative effect of the climatic factor(s) in context of a multitude of other contemporary issues. Another complication of conflict attribution, made apparent by the Syrian conflict, is that there is a pre-existing highly-politicised battlefield for assigning blame in such situations, which doesn’t really exist for extreme weather event attribution (other than blaming gay marriage, HAARP etc.). I’ve seen a number of climate change commentators argue against linkage to Syria, and suggestions that there is an element of political expediency in attempts to do so. They’ve tended to cite papers which minimise the role of drought and instead blame the Assad regime for everything. Those commentators apparently didn’t stop to question whether the desire to place blame on Assad doesn’t have a similar ring of expediency to it in this political climate (no pun intended). Indeed, the paper most commonly cited in such pieces explicitly objects to discussion of climate change causation on the grounds that it diminishes our ability to pin blame on Assad, even assuming that climate change played some role in events. Effectively the author is here arguing that, even if climate change was a major stressor which initiated conditions conducive to instability, the blame for ultimate consequences should pretty much always and entirely be squared at the government for failing to manage the situation. From what I’ve read this is a common mantra/paradigm amongst economists and political science types. And from their perspective it makes sense: what they’re ultimately interested in is optimum decision making given a particular situation/scenario. You don’t get anywhere by blaming the situation you find yourself in, after all. However, I can’t help feeling there’s a paradox in there too, at least a psychological one, particularly with regards a problem like climate change. By framing things like this they essentially dismiss climate change as a consequential problem in the minds of many, while simultaneously insisting that governments should have taken it seriously enough to pursue major adaptation strategies. ATTP – “Yes, I realise Roger has spent most of his career on this topic. However, these land use effects don’t somehow negate the impact of the continued emission of GHG into the atmosphere. I did not imply that land impact negates the impact of the continued emissions of GHG. We’re talking about climate effects on conflicts. In my opinion this idea has risen out of a simple extrapolation of Mid East politics — using Syria as the example. The Syrian drought (likely) has contributed to the crisis. It is a stretch to blame the Syrian drought on emissions of GHG in light of the massive land use changes since 1950. ATTP – Also, the latter is essentially a global, rather than regional, issue, while the former can probably be mostly dealt with regionally, rather than globally (unless you think that we should globally regulate how we use land at a local level). I agree — however, people are using the local example of Syria and extrapolating it worldwide. I quoted Obama as an example. People seem to be missing that conflicts have been trending down worldwide ever since the end of WWII. I’m not suggesting an approach to globally regulate agriculture — only that you can’t operate your television using your microwave keypad. Global regulation of climate change will not affect the Syrian Civil War. I don’t believe that climate science is lacking in scientists who take this approach. I also quoted scientists other than Pielke. No, that’s not what I’m saying. I’m saying that any indication of climate change in the “conflict” signal is too small to detect within other causes. You can’t assume a conclusion until it is demonstrated. Yes, the Middle East is hot. Yes, there are conflicts in the Middle East. These are facts that we “know” intuitively. That intuition is not the same as concluding that the heat contributed to the conflicts. In other words, I’m arguing the opposite of what you contend. In order to prove a link between conflict and climate change, you have to demonstrate a signal which is above the noise. You can’t assume that it must be there so it is within the noise. I gave four contributing causes to the Syrian Civil War. The focus is on the drought because that is the one that people attribute to Climate Change. It’s hard to ignore the impact of the drought because it is so pervasive. Then, world leaders extrapolate the Syrian Civil War to the entire word. We’re talking about climate effects on conflicts. Well, yes, but even if (as I could easily believe that they are) changes in land use can be an important factor, this doesn’t mean that emission-driven climate change cannot be. I agree — however, people are using the local example of Syria and extrapolating it worldwide. Not sure what you mean by “extrapolating it worldwide”? It appears (from Magma’s comment) that increased drought in the Middle East is one of the more robust precipitation-oriented projections as a result of manmade GHG climate change. Yes, I gather that there are others who work on this. Therefore, it is not as ignored as Roger often seems to claim it has been and might not be quite as important as he seems to think it is. I was simply pointing out that Roger seems to have very strong views about this and seems to regularly publicly berate those who focus on things that he seems to regard as less important. Global regulation of climate change will not affect the Syrian Civil War. Indeed, but mitigating climate change may reduce the risks of climate related events that could enhance stresses in the future. I really don’t think anyone is suggesting that doing things now will have an impact on conflict today. The suggestion is that if such events could stress these regions, then maybe we should consider reducing our emissions so as to reduce the risks associated with climate change in the future. Of course, even if climate events do not lead to conflict (but instead lead to cooperation) it would still seem worth trying to minimise the climate-related stresses that such regions may face. However, one thing we can say is that increased drought in the Middle East is one of the more robust precipitation-oriented projections as a result of manmade GHG climate change. towards decreased precipitation in the Amazon, Central America, and South Asia. All these features appear to be erroneous ( Figure 9.4d ). 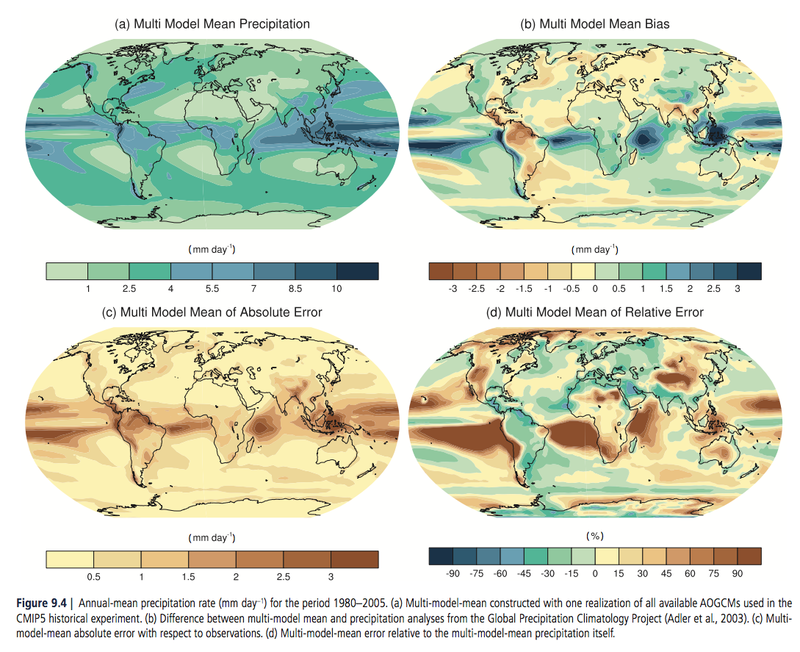 GCM precipitation projections are very poor and have gotten worse from CMIP3 to CMIP5. Changes to global mean temperature may well be predictable because the global mean temperature is implied by the changes to radiative forcing, independent of motion within the atmosphere. Precipitation, on the other hand, is quite dependent on motion, the motions that we know are not predictable. lorcanbonda: I’m saying that any indication of climate change in the “conflict” signal is too small to detect within other causes. You can’t assume a conclusion until it is demonstrated. That seems fair. I think Obama put it about right when he said There’s already some really interesting work — not definitive but powerful — showing that the droughts that happened in Syria contributed to the unrest and the Syrian civil war. Although not definitive, it is certainly powerful because if there is a relationship between change in climate and conflict then it could lead to an unfortunate reversal in the conflict trend as global warming takes off. Yes, aTTP, people can be wonderful in crises, working together. The scenario I had in mind, as others have pointed out, is extreme: the current horn of Africa with 20 million at risk of famine, Syria, etc. Venezuela, perhaps, to go elsewhere. When your neighbors are starving too, there might be some limits to what cooperation can do. I perhaps do too much reading; my New Yorker and other news outlets tend to take a broader perspective and look at injustice with a microscope at times – or since that injustice is systemic, especially for women, perhaps I mean with a hard reality-driven kind of reporting. One has to harden one’s heart to even learn about what is going on in so many locations. There are two arguments about climate and conflict, and it might be worth separating them. One is that heat exacerbates tempers, and I’m inclined to leave that argument alone. The other is that increasingly extreme and/or chaotic climate affect living conditions, particularly the food supply, and a large community in desperation is not always rational about solutions, while the less thoughtful (I cited particularly adolescent males) tend to act rather than think. Once there’s no food, breakdown is a matter of hours not days away. I was saddened to see this wonderful project was abandoned. It was one of the most heartwarming and useful actions I’ve ever seen. A search on “Greening the desert” produces more recent material. Of course the move toward renewables does impact the demand for oil. It may not be detectable yet. And we all know about Venezuela. Stressors and all. Personally I think we should be careful about cutting coal those folks who mine it own picks and shovels. They could do something like help elect and orange headed lunatic. . When you have many causes large and small and hard to measure it’s easy to single one out..stress and stressors. Let’s not Forget the great Eskimo wars of 1478.
it exists as a function of latitude that everyone experiences on traveling a degree or two north or south, but the effect can be rendered irrelevant or imperceptible, erased by diurnal variation ,if , say, we drive three hours north before noon, or south after the sun is at its zenith. Those predisposed to view multidegree AGW as an existential threat have been reltively silent as to some of the greatest demographic realities of the last century- the burgeoning population of Africa, and the mass migration into America’s sunbelf from its more ‘temperate’ regions. As tropical medicine and heat pumps have thus far trumped climate change and conflict in changing how the world is peopled, local population growth and the ensuing resource stress may figure more in the dynamics of conflict that the glacial migration of warming temperatures across the landscape, and the enduring existance of Europe’s large and largely prosperous below sea level populations reminds us that conflicts involving the invasion of inland neighbors is not the only plausible demographic response to rising seas. Shold this prove so, among the coastal ecotremes in greatest danger from AGW may be those on relatively uninhabited or undeveloped shores. I assume the Eskimo item was meant to provide /sarc on the historical view, and point out that one can get tangled in the thickets. I know that, but it’s no excuse for belittling our current predicaments. Coal miners need help, not insults, I agree. They’re more likely to get that from the people they vilify, but I can, in the end, mostly only change myself. Oh dear, need to be wary of the control freak commercial interests. That was meant to be a link only, but it’s an interesting item. Next time I won’t put links like that on their own line. Fagan has written several excellent climate history books. Definitely recommended on the strength of those I have read. Bangladesh? Russell, you’re right it’s complicated and we are all aware that few take the long view and/or act in their wisest self interest. I’ve done some checking about northern Europe below sea level, and it appears they’re in trouble with the recent acceleration. “Changes in the frequency of extreme events coinciding with global warming have already been observed, and there is increasing evidence that some of these changes are caused by the impacts of human activities on the climate. I am surprised that lots of folks don’t easily connect the dots and recognize that global warming is already exacerbating conflicts around the world. This is a situation that will not get better as globe gets warmer. Again, I did not claim that it could emission-driven climate change cannot be a contributor to conflict. I just don’t think it is valuable to assume it is based on Middle East Conflicts. For extrapolating worldwide, see the Obama quote below. He’s not the only one who has made these sorts of claims, but he’s probably the most credible. ‘Well, if you start magnifying that across a lot of states, a lot of nation states that already contain a lot of poor people who are just right at the margins of survival, this becomes a national security issue. Paulskio — I agree with most of what you write. Especially this, “I’ve seen a number of climate change commentators argue against linkage to Syria, and suggestions that there is an element of political expediency in attempts to do so.” I’ve seen those suggestions, too. Even though I believe al-Assad deserves primary blame, that does not mean that we should fail to understand the other causes. I cited several articles. One is showing that the water scarcity is being caused by al-Assad policies. 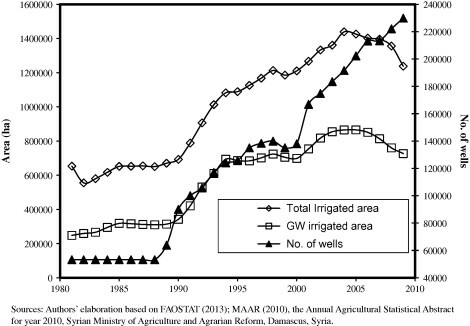 Others show that there is a strong (regional) link between land use changes and drought. The al-Assad article was to show just how extreme his policies have been. Getting another 3 degrees of rise by 2100 means averaging over .36 C / decade. for the 83 years remaining , which is several times the instrumental trend – I don’t pretend to know why the CO2 response has been as linear as it has but , relatively linear it has been. The clearest and must humbling decadal signal since 1988 has been the more or less decadal walk-back of the modeled projection range extremes as waypoints fail to materialize- the last copy of Six Degrees I saw was on a remainder table. and I can’t find anybody to bet on which if any decade of this century will be the first to see a half degree rise, let alone a whole one. Well, it depends on our emissions and on the carbon cycle feedbacks. If we do happen to follow a high emission pathway, then we could triple (or more than triple) the current change in anthropogenic forcing. Even if the response is linear (and, as we warm, it may not be) then another 2-3K by 2100 is certainly possible. I just don’t think it is valuable to assume it is based on Middle East Conflicts. I think we’re talking at cross purposes. I’m certainly not arguing that we should extrapolate based on Middle East Conflicts. Also, your interpretation of what Obama was getting at seems rather odd. My interpretation is simply that he’s suggesting that we may want to avoid stressing other parts of the world in a similar way, if we can. Are we not meant to learn from our experiences? At current levels of carbon dioxide we return to the mid-Pliocene with sea level about 25 meters higher than now. This is inexorable and will certainly lead to violence as the ocean side dwellers are forced to move to higher elevations. There is Post-glacial rebound (also called either isostatic rebound or crustal rebound) That tends to affect the Northern part of Europe in particular. I went to Norway last year where it’s past effects were very evident. Perhaps Susan could clarify her comment. Russell’s “Europe’s large and largely prosperous below sea level populations” Holland? 1890-2014 sea level rose by 23 cm. Analysis of the sea level data averaged over six stations, do not show any acceleration. In fact on eyeballing there has been no rise in the last 20 years. Angech, it is always wise to check up on references. The part you quote about the Dutch engineers is correct…but with loads and loads of caveats. Technically it is indeed feasible to protect against flooding for centuries to come. Whether it is societally feasible is a completely different question. The quote you took from a website refers to a paper by Tol et al in 2006, which further referred to an older study that had asked the question what could be done in case of a 5 meter sea level rise. Well, just raising dikes 6-7 meters is possible. Sure. It costs a lot, and you’d have to give up a lot of land to be used for those higher dikes. You’d also have to start pumping a lot more to keep the water out, but it can all be done, from a technological perspective. But would people want to live in such an environment, and perhaps equally important, would companies want to stay in such an environment? The article from which you selectively cite already follows the quote you found with a caveat, and also Tol’s paper makes your quote a good example of quote-mining that little small part that soothes your mind, ignoring the rest. I think I pointed out that pattern in behavior in you before. And since I am on a role with being sarcastic and passive aggressive, I just cannot let lorcanbonda’s comments stand on the complexity of the Syrian conflict, and his extreme oversimplification of the Pax Europaea. Yes, I know there are some who ruthlessly promote the Democratic Peace Theory as the (one, only, and single) explanation, but it is far from the sole hypothesis. Let’s not forget that this Pax Europaea of currently 72 years includes over 40 years with a Europe largely divided into two areas, each with nuclear weapons pointing at the other side. If that’s still because of democracy, I wonder how we explain the 200+ years of the Pax Romana. Global warming is happening globally. If there is a relationship between climate change and conflict, there is no reason to think it would be limited to Syria (is there?) – especially as we start to exceed the “safe” thresholds set by various climate accords. Although raising levees and sea walls can keep water out, once you have a situation where low tide is higher than ground level inside the wall, you have to pump all the surplus water out, which might include some significant rivers.. unless you want to aqueduct them for potentially hundreds of miles. At which point you have a system that is very fragile; one natural disaster away from losing everything. Sometimes geography makes this feasible, as in the San Francisco Bay Area, where a dam across the golden gate bridge area would save a large chunk of California. Other places, like Hull in the UK, are basically indefensible. I could easily see the Straights of Gibraltar being dammed to protect the entire Mediterranean coast from sea level rise. As far as conflict goes.. a well adjusted rich country can adapt to shifting climate zones by a variety of means and so should not be destabilized by global warming, even in large amounts. Poor countries with weak governments and existing low level conflict, less so. A rapidly growing body of research examines whether human conflict can be affected by climatic changes. Drawing from archaeology, criminology, economics, geography, history, political science, and psychology, we assemble and analyze the 60 most rigorous quantitative studies and document, for the first time, a remarkable convergence of results. We find strong causal evidence linking climatic events to human conflict across a range of spatial and temporal scales and across all major regions of the world. The magnitude of climate’s influence is substantial: for each 1 standard deviation (1σ) change in climate toward warmer temperatures or more extreme rainfall, median estimates indicate that the frequency of interpersonal violence rises 4% and the frequency of intergroup conflict rises 14%. Because locations throughout the inhabited world are expected to warm 2 to 4σ by 2050, amplified rates of human conflict could represent a large and critical impact of anthropogenic climate change. I think that’s the paper that I mentioned in this comment. After publishing that, there was a comment from a group including Clionadh Raleigh and Richard Tol, and then a response from the original authors. This article suggests that we might want to discriminate between chronic and acute stresses when we think about whether stress increases cooperation or conflict. Mike says: I think this is a complicated question and I sense that Raleigh engaged in the same kind of narrowing argument that she projected on social scientists who have studied global warming and found a causal link to conflict. The truth is probably that global warming will reduce stability and many societies will experience chronic stress as a result of global warming. Some societies will choose cooperation as the default method of responding to the stress and some societies will choose conflict as the default method of responding to the stress. It’s not difficult to come up with a list of societies expected to choose cooperation and a list of societies expected to choose conflict. An example of how simple this is: You can look at the stress of the September 11th attack on the US and how the country responded to this acute stress by choosing cooperation in mounting attacks in numerous countries around the world based on the cooperative spirit empowered by the acute stress of an attack on the US society. That’s about as simple as it gets, is it not? ATTP says: I think that’s the paper that I mentioned in this comment. After publishing that, there was a comment from a group including Clionadh Raleigh and Richard Tol, and then a response from the original authors. Yes, I skimmed that one, the group comment and the author’s response. I think I also linked to other studies, but I could be wrong about. I have read your thoughts about Raleigh’s presentation and I agree with many of your thoughts as posted here. The required dam (or pair of dams) spanning 15 to 20 km with a minimum maximum depth on the order of 500 m would be the largest civil engineering project in human history. And reducing or blocking the strong counter-circulation of dense saline Mediterranean water with fresher Atlantic water (the Mediterranean loses more water to evaporation than it gains from its watershed) would have unpredictable but likely severe impacts on marine ecology. I don’t know if construction could ever be feasible (regardless of costs) given the near-impossibility of diverting flow four or five or five times greater than that of the Amazon River during construction. I’m hoping smallbluemike is pointing out the contradiction between the cooperative spirit and the resultant attacks. The whole thing is an object lesson in how we can’t prevent people from choosing the worst option, cooperative or not. The terrorists exceeded their wildest hopes because of the overreaction and the multiple ill-executed global “wars” that resulted, making enemies far and wide as we ruined the neighborhood for allies and enemies alike. Maybe that is a different paper. I watch and listen to Raleigh and I get a faint sound of axes being ground in the background. The takeaway for me is that I don’t want to spend much time trying to sort out what Raleigh is trying to accomplish. I get the feeling that it’s a combination of things. Partly it seems to be value-driven; highlighting that these regions contain people who don’t just respond mindlessly to stresses and that regarding this as a security issue potentially ignores that it’s really a humanitarian issue. I agree with this. On the other hand, I also get the sense that there is an aspect of focusing on what you regard as important. Potentially social scientists regard societal factors as very important, while physical/natural scientists might regard changes to our environment (especially the environment that allows us to live and thrive on this planet) as being important. Some catching up needed, apologies for getting ahead of myself. WRT Russell’s comment, I don’t think it’s useful to make any kind of linear projection. Perhaps a story about my local sea level rise, which I’ve been living near since the early 1980s might serve as an illustration. We had the Big Dig, and a change in my level of awareness in the interim, but recently I’m seeing a signal coming out of the noise. That signal involves a solidification of sea level rise to a point where the big tides without storms are overflowing our banks (see Boston King Tides for photographic evidence). I go out and take pictures when I’m in town. What seems clear to me is that we are on the cusp of an acceleration, on the curve of a parabola. A year or so ago I binge watched some videos about the Dutch projects (it’s possible I embarked on this because of Russell at the time), and it seemed clear that the Hamburg dyke (yes, my term is an oversimplification) was a massive and heroid feat of engineering. What seems clear is that in recent years escalation is straining every resource. Anyone who uses Tol as evidence needs their head examining. Tol is in it for Tol, not for the truth. Dyke across Straits of Gibraltar? Head explodes at human hubris and stupidity. We are unlikely to be willing to finance a perfectly reasonable and sensible harbor defense for Boston, which is almost blindingly simple by comparison (diMambro, 1980s: http://archive.boston.com/bostonglobe/ideas/articles/2010/06/06/defending_boston_from_the_sea/ ). As is pointed out, these ideas, even if possible, are likely to have unintended consequences that are worse than the problem. Well Susan, a dyke about 9 miles in length at depths up to 2900 feet… easy peasy. you say: I’m hoping smallbluemike is pointing out the contradiction between the cooperative spirit and the resultant attacks. Mike says, not so much that as trying to point out how cooperation and conflict are quite complicated, working through trying to deconstruct the Raleigh presentation a little bit. but if Raleigh is correct, and the chronic and acute stresses of AGW are going to make us cooperate more and fight less, I am ready for that. I would love to see that prove to be the case. Maybe first place for this rise in cooperative spirit would be to see most countries in the world raise their AGW efforts beyond the agreed-upon targets and start hitting the higher targets. If AGW will make us cooperate more, let’s do it. Maybe that would show up globally as a transfer of long term funding from military budgets to green energy, carbon sequestration and AGW mitigation. Does anyone see that happening? James Hansen once suggested (as a thought experiment/activist provocation) that Hudson Bay could be turned into a repository for about one metre of future sea-level rise if dams were built across the straits that link it to the rest of the ocean (plus a couple more on land, IIRC) and the rising waters were pumped into the new reservoir. In the same doc, he offered an alternative/additive solution that would submerge large parts of Russia. I can’t refind this doc. Pointers, anyone? The poldering and drainage of the Norfolk Broads began with encouraging Dutch emigration there the latter days of The Restoration, and the water meadows are massive- I recall going to a concert next to a Norman bailey once on the Norfolk coast and now 20 miles inland. The total area reclaimed and made areable may rival the Netherlands. Let me guess, crime goes way up in the summertime and crime goes way down in a downpour. There are clearly other exogenous factors (policing) that far outweigh long term temperature change. I am confused? That is Global sea levels that you quote correctly. My comments were directed to the graph of the sea levels off Holland only as per the reference to 6 stations which is eyeball correct. I would love to find a graph of SLR off Holland, England or Norway for the last 20 years. BrandonGates or JCH or Marco? sorry if the references fed back to a Toll involvement, not knowingly done, I was only trying to check the SLR off Holland. Angech, I did not note that you referred to the Dutch situation only (maybe add references? That’ll reduce confusion). Still, the Mark IV eyeball to estimate trends is really, really bad to use. You can download the data yourself, and you’ll find that the linear trend over the whole period (1890-2014) is 1.86 mm/y, and 2.19 mm/y over the last 20 years of data (1995-2014). I read that the Dikes are already raised very high and have been designed for 1 in a thousand year floods inland rivers and 1 in 10000 years from the sea since 1953. They have been extending their land out to sea for 1000 years.https://www.rijnland.net/downloads/floodcontrolrijnland-1-1.pdf was an interesting read. Thanks, very much for the data. One of the benefits of this site is that people who know how to access the data will do so for others. I really find it hard to access this data. The rise for Holland you quote is certainly not flat, so eyeball failure? on my part. One of the benefits of this site is that people who know how to access the data will do so for others. I really find it hard to access this data. Would you mind providing the source and link for the graph so that angech can access this SLR data himself? 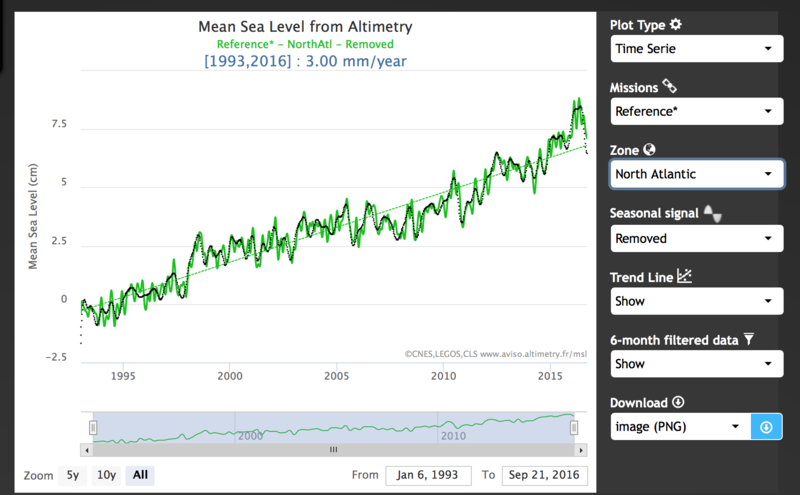 Angech, the data was provided on the website from which you (very likely) quoted about the sea level rise over the period 1890-2014 and “eyeballed” the supposed nonrise over the last 20 years. Dutch water defenses are a continuing work in progress, and not uncommonly lead to litigation when yet another person must give his land to the government (usually at a rather low price) to allow the coastal and waterway defenses to be improved. It’s linked at the Colorado site that is most often cited. AVISO has a lot of tools like 10 and 5-year trends, regional trends, different missions, etc. It’s appears to me to be the best altimetry site. For tide gauges, I find the derived trends tool at PSMSL to be the most helpful. 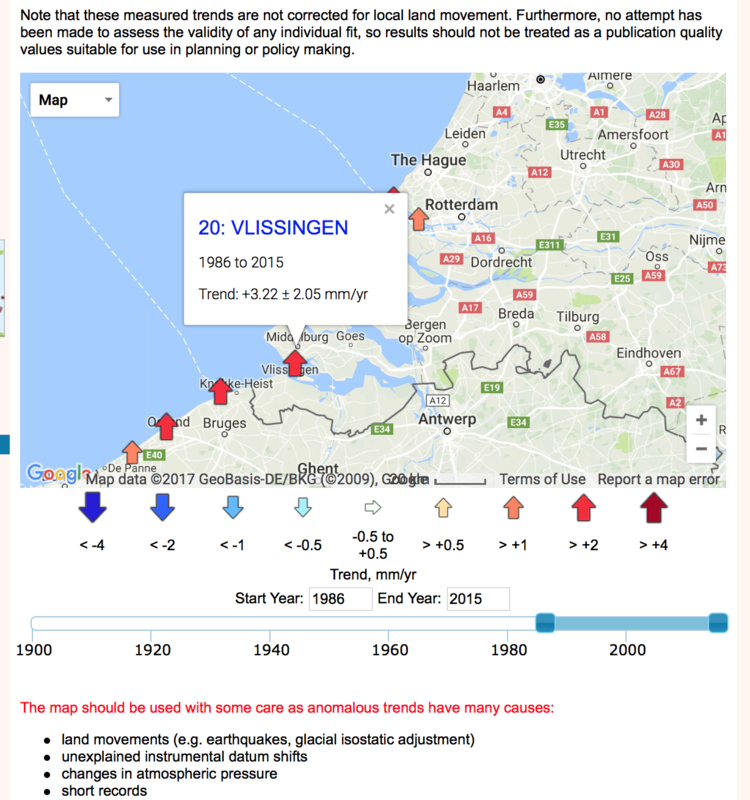 angech can eyeball several Dutch tide gauges… most recent would be 1986 to present data. AVISO serves to remind us there may be something to this ocean thermal mass business. Had Canute’s throne been parked at the high tide line, the Armanda could have saluted as it went under. There is little evidence of sea level rise in the 500+ years between Canute and the Spanish Armada, and some credible evidence there was none. Sea level seems to have been relatively stable since ~7000 ago until the 1800s. Can anyone suggest an instance when climate conditions have inhibited or prevented conflict? ‘Diverse evidence for a sun-driven, rapid (<50y), c.5m sea-level rise c.600AD (Dark Ages) contradicts Intergovernmental Panel on Climate Change (IPCC) and presages another c.5m rise by 2050 unrelated to CO2: impartial (unfunded) literature review. Abstract only. REJECTED"
Toot. Toot. Time to go for a ride on the Crazy Train! If ever something needed to be in all-caps, that was it. But he did miss out the 5m sea level rise that happened last Tuesday, a lot of people did. Hey, it was on Google Scholar, so surely it’s scholarly. Thanks, JCH. I only asked because angech forgot to. Napoleon and Hitler’s failed attempts to invade Russia? Apart from the Arma(n)da and the claim by Raleigh (probably no relation) that cattle-raiding is inhibited by drought, you mean? The Defense Intelligence Agency estimated that seeding increased rainfall “in limited areas up to 30 percent above that predicted for the existing conditions,” but this figure admittedly was the result of “empirical and theoretical techniques based on units expended and the physical properties of the air mass seeded”-in short, a scientific guess. Sensor data showed only that the enemy consistently experienced difficulty keeping traffic moving through the monsoon rains, a normal problem for that time of year. So conflict probably wasn’t inhibited by much, if at all, but then the modern literature of climate change as a cause or exacerbator of conflict is similarly unimpressive and similarly reliant on assumptions and guesswork. I read (OK, skimmed) a newish addition to that literature today, a working paper co-authored by Marshall Burke, the then-PhD student who made headlines (as intended) just before COP15 with a paper called ‘Warming increases the risk of civil war in Africa’. In the new one, ‘The Economic Origins of Conflict in Africa’, Burke and McGuirk say that modelling the effects of climate change on food prices and the effects of food prices on conflict shows that if climate change had magically ended in 2000 then food-price-generated conflict in Africa would be halved in 2050. ‘We interpret our results with caution,’ they say, then urge policy-makers to use them as tools for reducing conflict. When somebody says “Armada”, I think Pacific and the Kamikaze… the Mongol Armadas that were twice defeated by the divine wind. Pacific winds also gave us Professor Curry and the disciples of the PAWS. 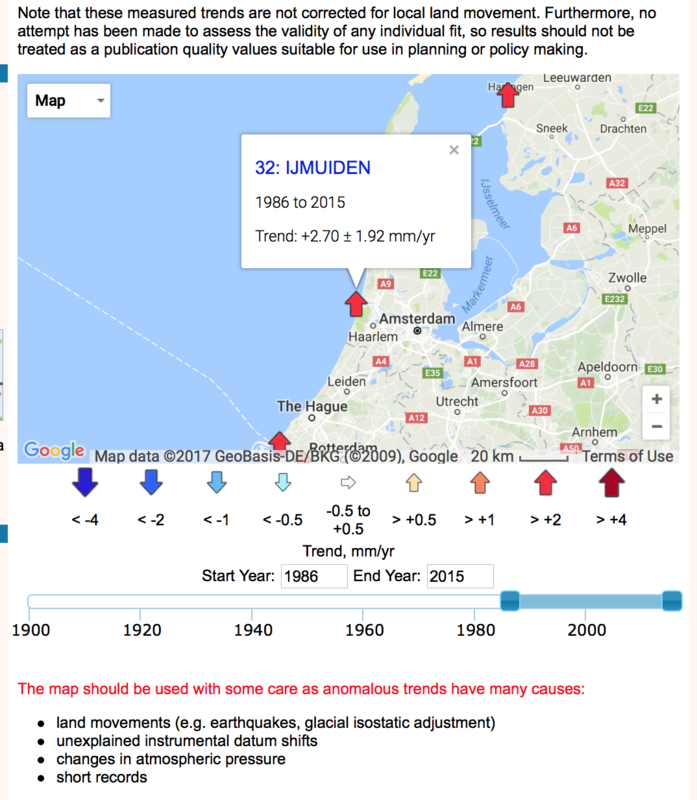 JCH , the North Atlantic sea level rise graph you show has nothing to do with the tidal gauge measurement of sea level rise at the 6 stations in Holland. Thank you for putting up the graph. It does deflect from the subject which was whether the Northern parts of Europe are having increasing rates of sea level rise. I realise you are acutely aware of the different measurements out there and know how to access them. The fact that the land can rise and fall independent of the actual sea level rise ( Glaciers melting in the last, subsidence, plate shift etc) has to be acknowledged and taken into account. Marco, are you able to put that graph up for fairness in comparison? It is and has been for a long time. See eg. Peltier (1996). Specific to satellite altimetry, see here. AVISO has two zonal products that could be relevant to Northern Europe than the graph for GMSL: the North Atlantic and the Northern Hemisphere. One leaves out the Northern Pacific. Silly me, I picked that one.